Imagine, having your ADs on every Fed Ex, UPS or Walmart Truck you see this week! * Outdoor Media Reaches 95% Percent of U.S. Consumers, over half the American people on any given day. 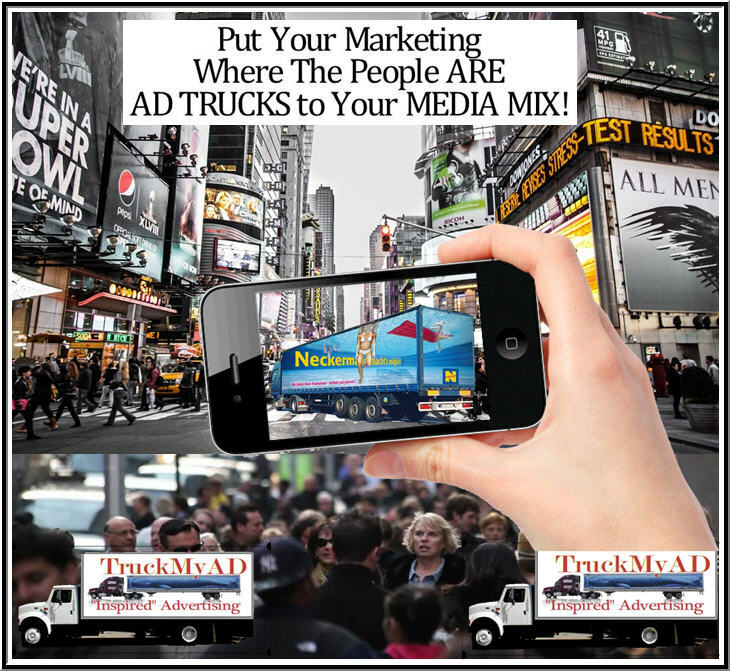 * Truck Side Marketing programs offer you the ability to Advertise 8-10 hours a day, 5 to 6 days a week. * 18 million annual impressions generated by a truck in a DMA market of more than 5 million people. 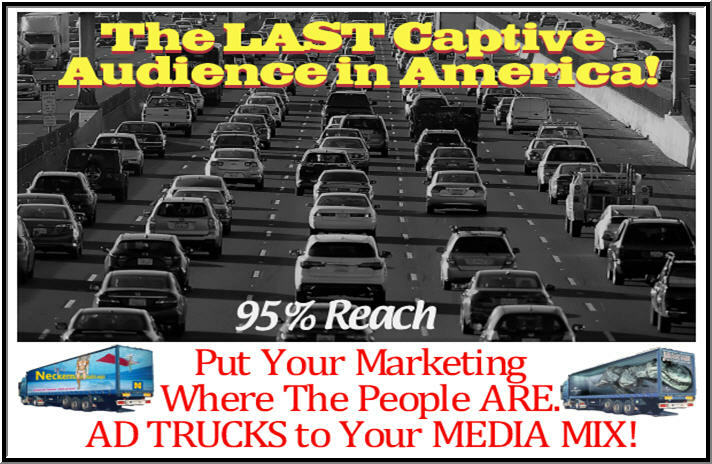 * Box-van trucks generate - 6.4 million impressions a yr. The average is around 80,000 Impressions a day. 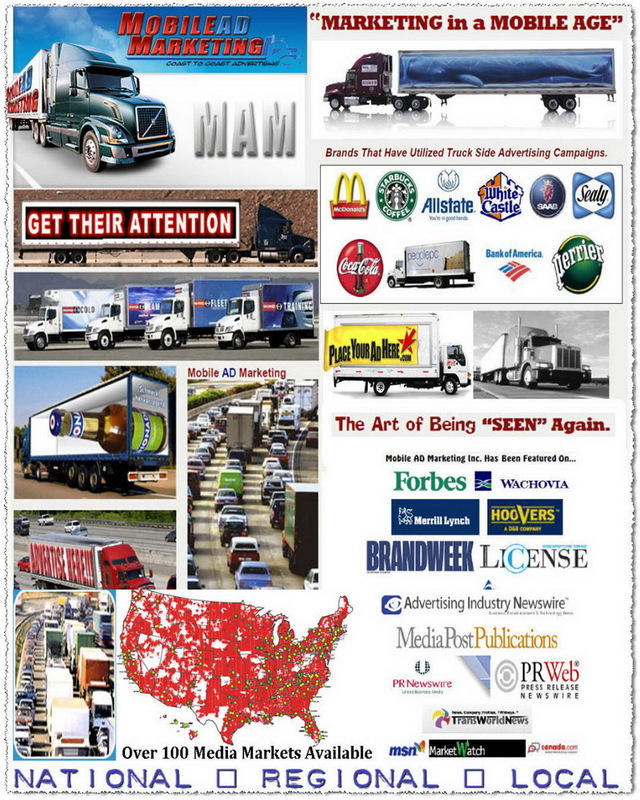 * Typical Semi Trailers travel 125,000 miles a year gaining 24,000,000+ impressions annually per vehicle. 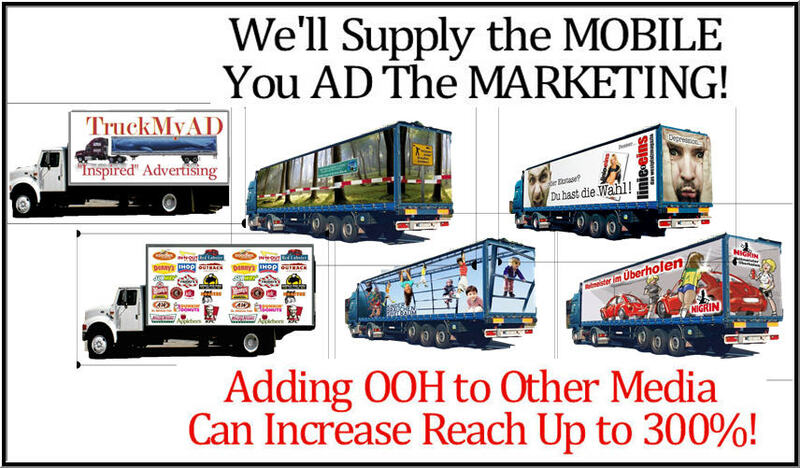 * With as few as 4 to 14 AD Trucks in most DMA’s you can reach 3% to 50% of the population on a daily basis. * The price of an Ad Truck is 2 to 3 times cheaper than a Billboard. These AD Trucks drive past dozens of billboards a day! * MAM vehicles can achieve 85% reach and 20x "frequency" each month - Advt. Publications Research Corp.
* Impact rating of Mobile Media Trucks were higher than all forms of advertising. * Mobile billboard displays boost name recognition 15 X greater than other advertising. * 96% Percent of respondents who felt AD Trucks had more impact than traditional billboard advertising. 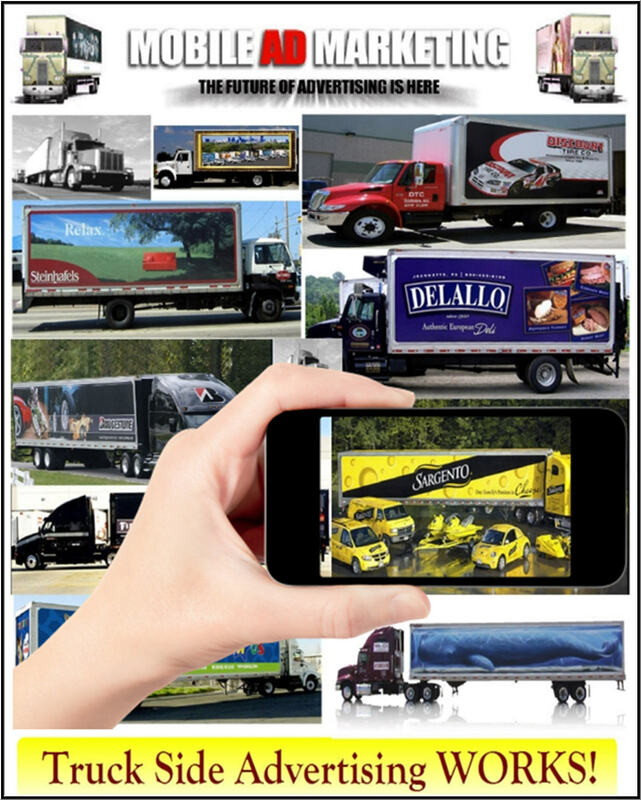 * 98% Percent of respondents who felt truck side ads created a positive image for the sponsor. 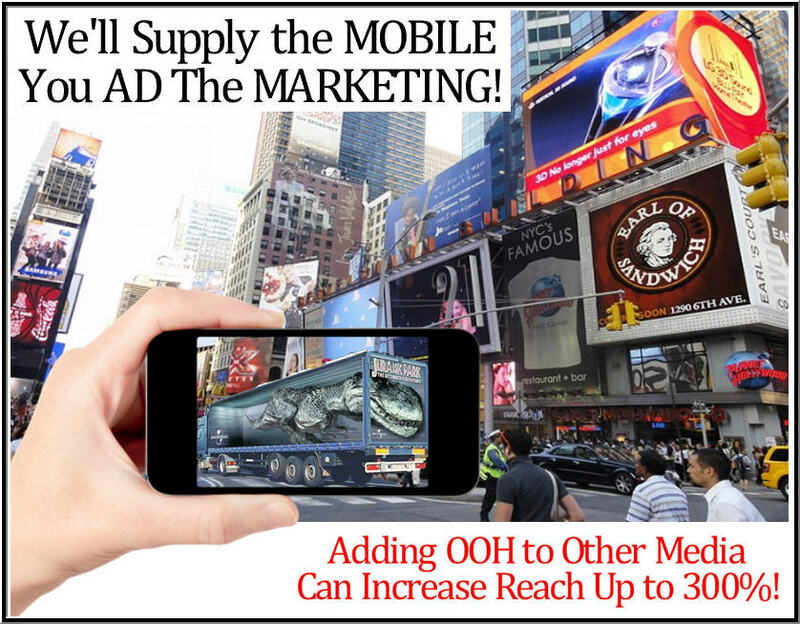 * These AD Trucks become low cost "impression machines" generating new customers daily. * 91% of audience notices words and images on AD Trucks. * 97% remember Truck Side ads vs. only 19% for Billboards. 100 AD Trucks | 6 Month Campaign | Top 10 Metro Markets | 900 Million - 1.5 Billion Impressions.